There are some cities where staying in a hotel seems like the best option, but in a city like Savannah where nearly all of the best sights are in the heart of downtown and you can walk nearly anywhere, a better choice is Savannah vacation homes. 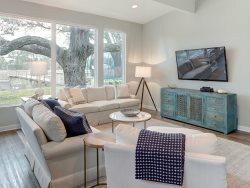 With Southern Belle's Savannah vacation rentals, you'll get the opportunity to stay in a fully furnished and renovated house in the heart of downtown near everything you want to see. You can simply walk out your door and be immersed in the sights and sounds of Savannah. It's one of the best cities in the country for walking and you can enjoy that feature much better with vacation homes in Savannah GA.
One of our larger Savannah vacation homes is Change Of Place, located near the popular Forsyth Park. This house can comfortably sleep 10 guests with three bedrooms and three bathrooms. As with all of our Savannah vacation rentals, it is totally furnished with a combination of modern and nostalgic pieces. It has comfortable seating and bedding, plus a fantastic gourmet kitchen so you can cook meals in. One of the biggest draws for our vacation homes in Savannah GA is our strong record of customer service. You'll always find our Savannah vacation homes completely cleaned and stocked for your stay. Other great amenities include flat-screen TVs throughout, a washer and dryer, cable service with HD channels and free Wi-Fi, air conditioning, ceiling fans and off-street parking for two vehicles. Step into this comfortable property and find yourself in an expansive living room with ample seating and a flat-screen TV. Large windows let in plenty of Savannah sunshine. 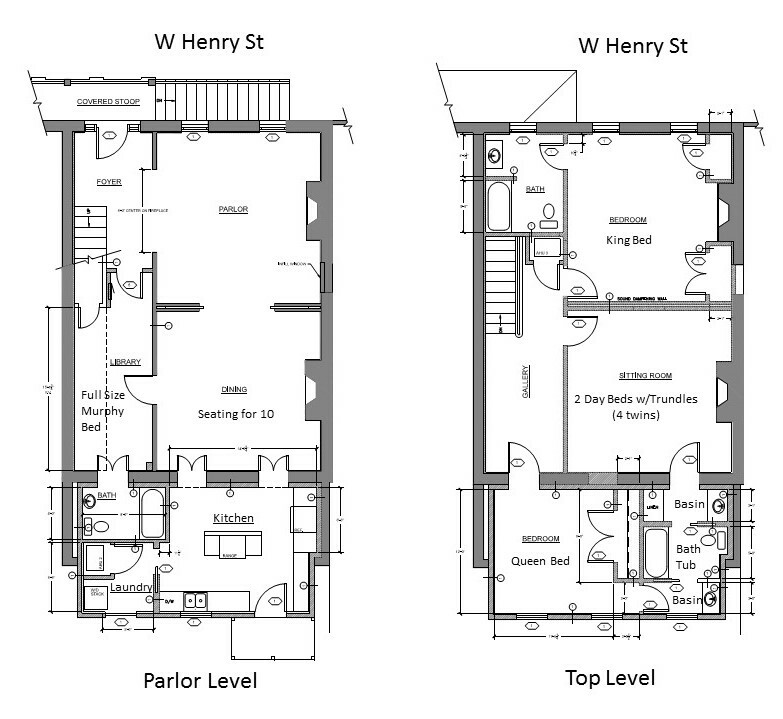 Adjacent is the dining room and a staircase leading to the next level. Bedrooms are well-furnished and decorated with comfortable bedding, ceiling fans and windows. You'll find a second sitting room on the next level with another flat-screen TV and comfy sofas. The dining room has seating for ten and is in a nice large room. Wood flooring is in most rooms in this property, except for the kitchen and bathrooms. The gourmet kitchen features an island with a range, tons of counter space and another small table for two. All necessary appliances are available, including a coffee maker and tea kettle. This is a great property for a big family or two families vacationing together. It features a king bedroom with a private bath and a queen bedroom with an attached bath that is shared by another room. A private library offers a double Murphy bed and an attached bath. The extra sitting room has sleeping for four with two daybeds with trundles for a total of four twin beds. Our Savannah vacation rentals are always within walking distance of a variety of Savannah attractions. This one happens to be only a few streets down from Forsyth Park, which is guaranteed to be on your to-see list. This huge park features numerous walking trails and places to sit or picnic. You'll find the famous iron fountain on the main walkway and further in, two war memorials and the Fragrant Garden for the Blind. Getting around Savannah is easy with walkable streets and plenty to see just about everywhere. You can also hop on and off the Chatham Area Transit throughout the Historic District. A great way to maximize your time in the city is to take one of the many organized tours. You can select from tours that fit your interest, such as Civil War or ghost tours, or you can take a fun mode of transportation such as a horse-drawn carriage or an old-fashioned trolley. The City Market, River Street, Victorian District and Historic District are Savannah's most popular neighborhoods for sight-seeing and you'll definitely want to visit all of them for a look at historic architecture, as well as a variety of shopping and eating options. For history buffs, Savannah has no shortage of museums either. Some popular ones include the Savannah Visitor Center and History Museum, the Ralph Mark Gilbert Civil Rights Museum, the Ships of the Sea Museum and the Roundhouse Railroad Museum. You can also check out the First Saturday on the River Festival if you're in Savannah between March and December. Start and end your search for Savannah vacation homes with Southern Belle. We provide the best amenities and customer service for all our Savannah vacation rentals. Our selection of vacation homes in Savannah GA has something for everyone and every size of party. Give us a call today! The members of your team were helpful, courteous, followed up without multiple attempts to contact, and the best...worked with our groups' circumstances. Please refer above. We overall could not have asked for better. Thanks! The tam was very accommodating and even came out to show me how to operate the lock when we got into the house (as i could not figure it out). I highly recommend the team and this business when renting again in Savannah.